Two Kansas State University faculty members are among four recipients of one of the state's most prestigious recognition for scholarly excellence, the Higuchi-KU Endowment Research Achievement Awards. 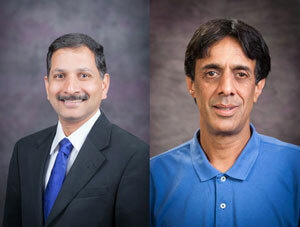 Vara Prasad, professor of agronomy, is the recipient of the Irvin E. Youngberg Award in Applied Sciences, and Bharat Ratra, professor of physics, is the recipient of the Olin K. Petefish Award in Basic Sciences. Prasad also is the director of the university's Feed the Future Sustainable Intensification Innovation Lab, which is funded by the United States Agency for International Development, or USAID. Prasad and Ratra were named university distinguished professors in 2016. This is the 36th annual presentation of the awards, established in 1981 by Takeru Higuchi, a distinguished professor at the University of Kansas from 1967 to 1983, and his wife, Aya. The awards recognize the exceptional long-term research accomplishments of faculty at Kansas Board of Regents universities. Each award includes a citation and a $10,000 award for ongoing research efforts. The money can be used for research materials, summer salaries, fellowship matching funds, hiring research assistants or other support related to research.